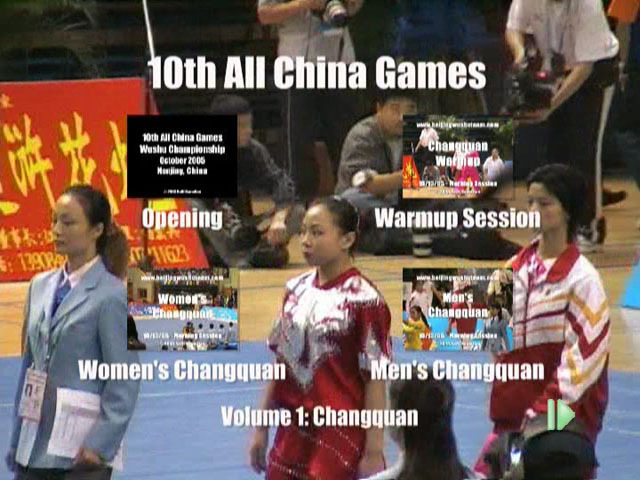 The 2005 10th All China Games Wushu DVDs was held October 13-15th, 2005 in the city of Nanjing. As with the 9th All China Games, this is the most important wushu tournament held as part of China's national olympics, held only once every four years. It features only the top athletes and features the following divisions for men and women: Changquan, Broardsword/Staff, Straightsword/Spear, Nanquan, Taiji and Sparring Sets. Except for Changquan and Sparring sets, each of these divisions is a combined division, meaning it was comprised of two events. For example the Nanquan division requires competing with both in individual southern fist form as well as a southern weapon division (Nandao for women, Nangun for men), likewise combined medals are given to the athlete with the highest score from straightsword + spear and broadsword + staff. In addition to the evolution of wushu nandu rules in the past four years, another significant difference from the 9th All China games is that Compulsory Changquan is no longer an event, but musical accompaniment is allowed in the individual forms. Volume 2: Nanquan / Nandao - NOW AVAILABLE! Volume 3: Straightsword / Spear - NOW AVAILABLE! <!-a href="#BS-St">Volume 4: Broadsword / Staff - COMING SOON! <!-a href="#TJ">Volume 5: Taiji / Taiji sword - COMING SOON! <!-a href="#Spar">Volume 6: Sparring Sets - COMING SOON! We have online ordering for domestic and international orders through PAYPAL.COM. If you don't have a paypal account its FREE, secure and easy to set one up then you can pay using your credit card. Click on the 'add to cart' button for the discs your interested in purchasing and then click on the 'view cart' button at the bottom to check out and complete the purchase. for US and CANADA ONLY! Athlete walkout for both divisions and judge's scores for each competitor are presented. All 13 men and 13 women competing in the Changquan division are presented on this disc. Men compete in Individual forms for Nangun (Southern Staff) and Nanquan (Southern Fist) while Women compete with Individual Nandao (Southern Broadsword) and Nanquan. This disc features 6 Women's Nandao, 13 Men's Nanquan, 12 Men's Nangun, 11 Women's Nanquan competitors. Athlete's walkout and Women's Medal Ceremony are also featured. Each competitor competes in both individual spear and straightsword. This disc features all 12 male and all 12 female competitors' forms in both straightsword and spear. Athletes' walkout and medal ceremony for both Men and Women are presented as well. If you're also interested in 2001 All China Games VCDs, click here. 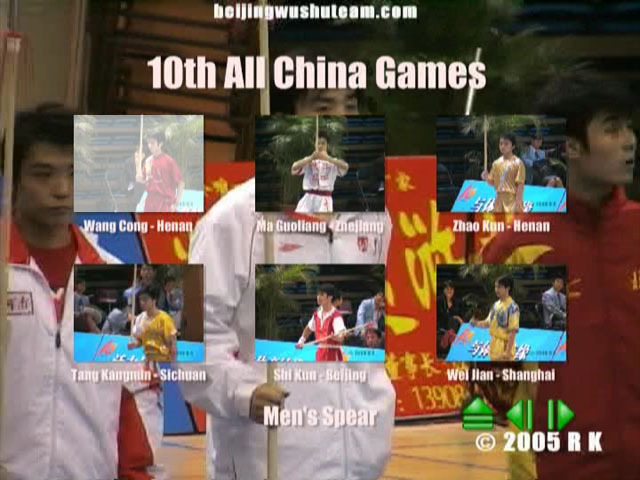 If you're also interested in 2004 China Men's Competition VCDs, click here. If you're also interested in 2002 China Nationals VCDs, click here. 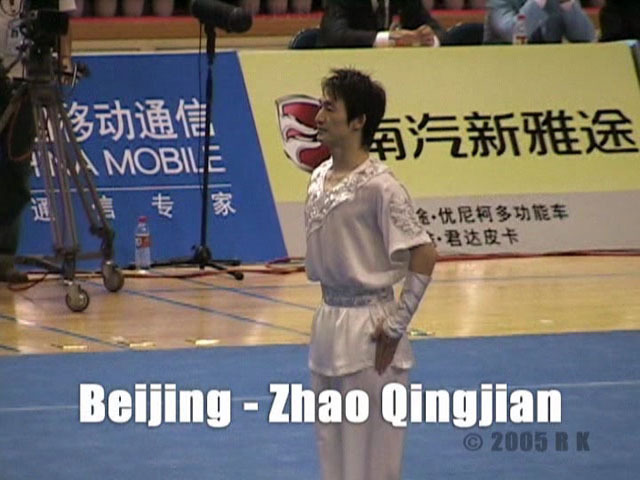 If you're also interested in great Old School Wushu from the Archives, click here. (you can save on shipping by ordering them together). Be sure to read the FAQ below first! If you have any questions, email me at raffi@beijingwushuteam.com. Where can I play this DVD? Is this a professional production? No, meaning you get the occasional head in the way, voices in the background, etc. But as you can see from the clips and stills above, the quality on these DVDs is very good and the editing and titles are better than you'll find on many 'professional' videos on sale. How much does it cost and how much to ship and how long will it take to get it? For orders to the US and Canada, the cost is $20 per disc. Shipping for up to 6 discs is just $3.95. It will be shipped US Postal Service priority. Domestic customers should get it within a week to ten days. For International orders, the cost is $22.00 per disc and $3.95 for shipping of up to 6 discs (since paypal.com only lets sellers use one set of shipping charges, the increased cost of shipping is reflected in the disc price). Discs will be mailed US Postal Service global priority. Shipping time depends on the distance and the foriegn postal service, so I can't make any promises about how long it will take to recieve it. What is the return policy? Due to the difficulty in shipping and crediting orders once they're sent, there are absolutely no returns. All discs are tested before being shipped, but if you have problems playing your discs, email me at raffi@beijingwushuteam.com . Is this product related to the Beijing Wushu Team? No, although I am a big fan, to the point where I have created the 'beijingwushuteam.com' website, this product is not related to the team. As I am a fan, I tended to get more footage of the Beijing Wushu Team athletes as they competed. 1) It is the latest wushu sets and movements among top athletes in China. Stuff you simply can't see anywhere else. 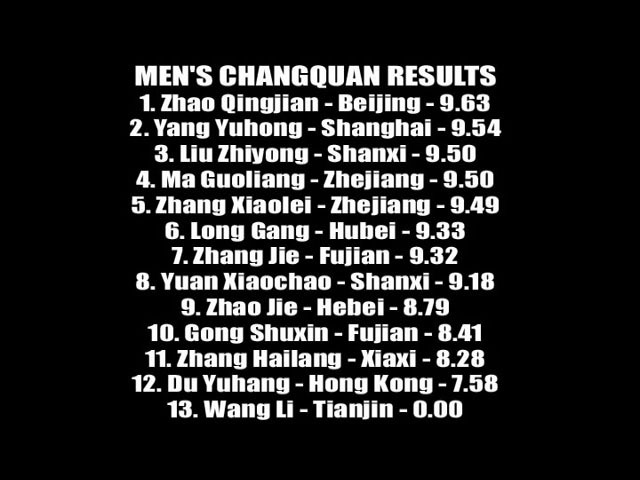 2) These DVDs actually have titles and in most cases, results in English, so unlike most wushu clips or tapes, you actually know who the athletes are, what team they're on and how well they did.